CINCINNATI — Kroger Co. announced Friday a partnership to bring Geoffrey’s Toy Box exclusive brands to nearly 600 Kroger family of stores across America for the 2018 holiday season. 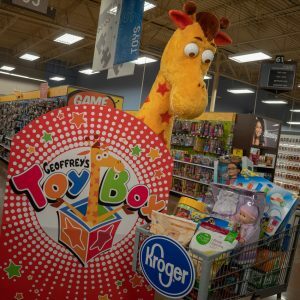 Starting this month, Geoffrey’s Toy Box branded merchandise and displays will appear in participating Kroger Family of Stores with a selection of 35 children’s toys, ranging in price from $19.99 to $49.99. The holiday program will feature exclusive toys from Animal Zone, Imaginarium, Journey Girls, Edu Science, You & Me, and Just Like Home. Product assortment will vary by location. “We are thrilled to partner with Kroger to bring a curated collection of product from our beloved portfolio of brands to American consumers this holiday,” added Richard Barry, executive vice president at Geoffrey’s Toy Box. To view Geoffrey’s participating store list, visit here.